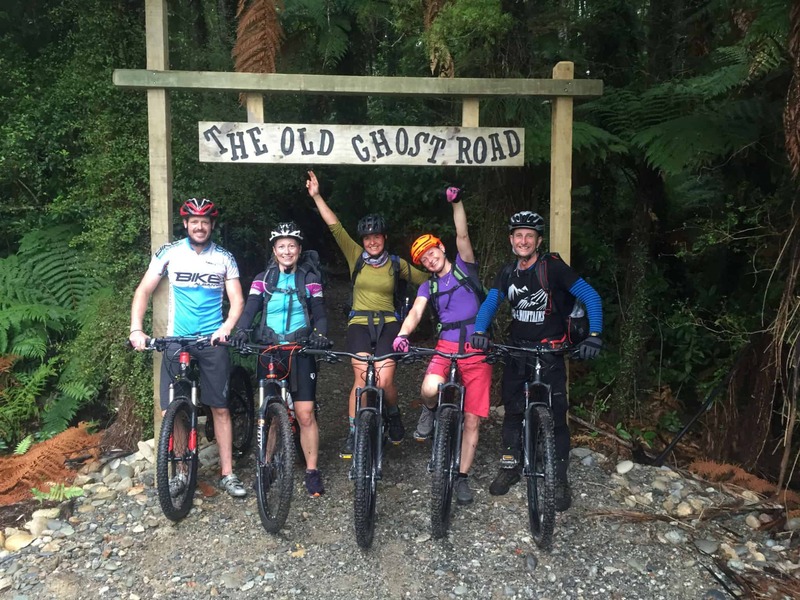 The Old Ghost Road opened in Dec 2015 and is one of NZ’s longest single track rides @85Km. 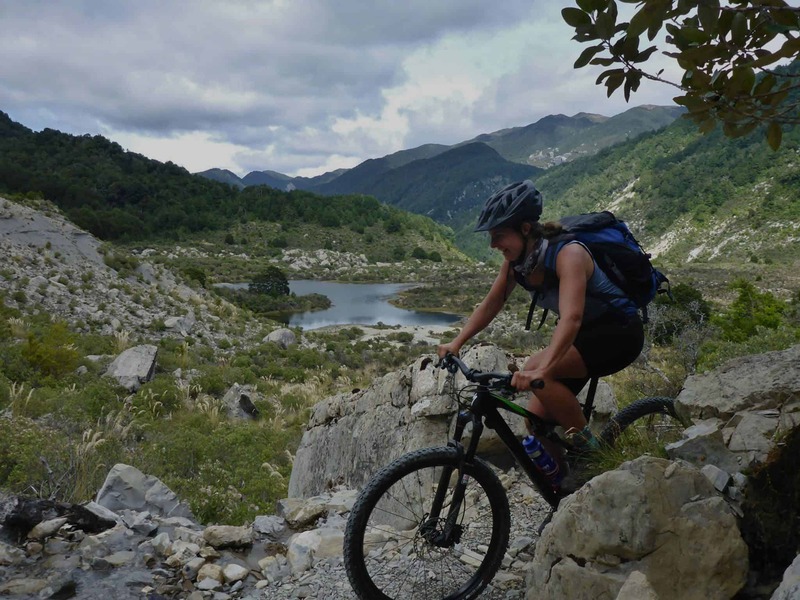 It’s a full on multi-day ride of technical grade 4 riding, big climbs and long downhills, impressive mountain ridge riding and excellent back country huts. Built by volunteers and by MTB’ers for MTB’ers! 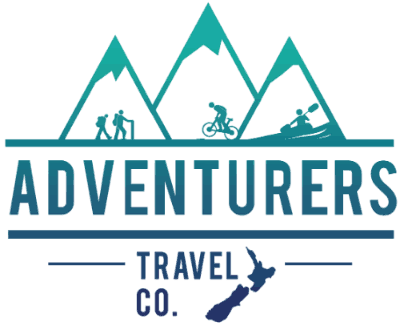 Adventurers tackled it with a group of friends and the verdict….. It’s UNMISSABLE!! We completed the ride in 3 days, choosing to make the most of the beautiful wilderness and staying Old Ghost Lake Hut and Specimen Point Hut. However it’s possible to complete it in either 2 or even 1 day! Beginning at Lyell Scenic Reserve in a carpark full of vicious sand-flies, we excitedly threw on our well packed rucksacks and headed off onto the start of the track. 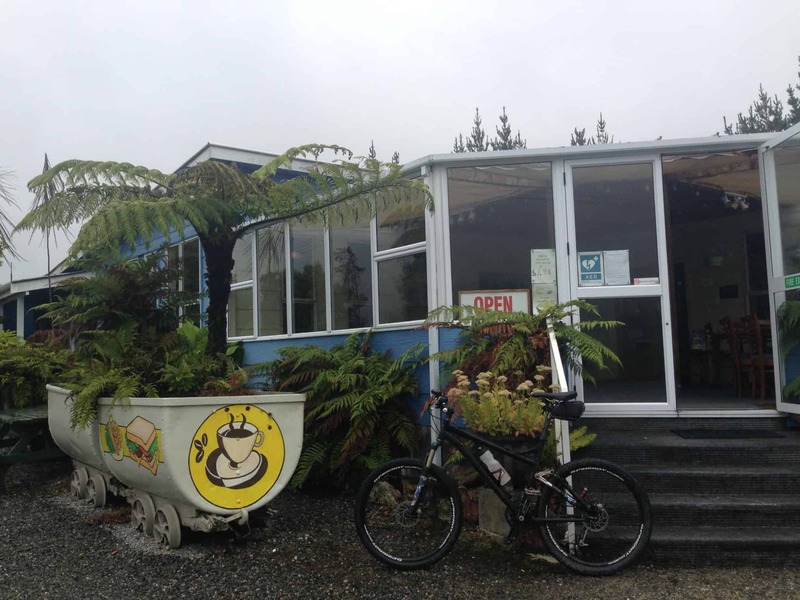 It’s 18Km to Lyell Saddle Hut. The first 15 or so Km is a steady climb up, with the last 3km flattening off slightly to get you up to 1200m. The track winds up along the side of a valley through native bush and zig zags in and out of numerous side valleys and through streams. You start to realise how high you’ve climbed as the views sporadically appear to the eastern side of the valley. 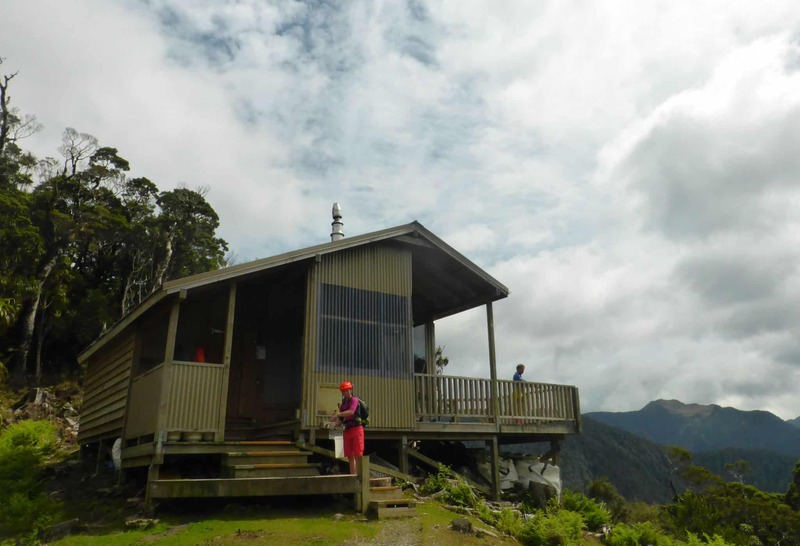 Lyell Saddle Hut is a great lunch spot with open views to the West. 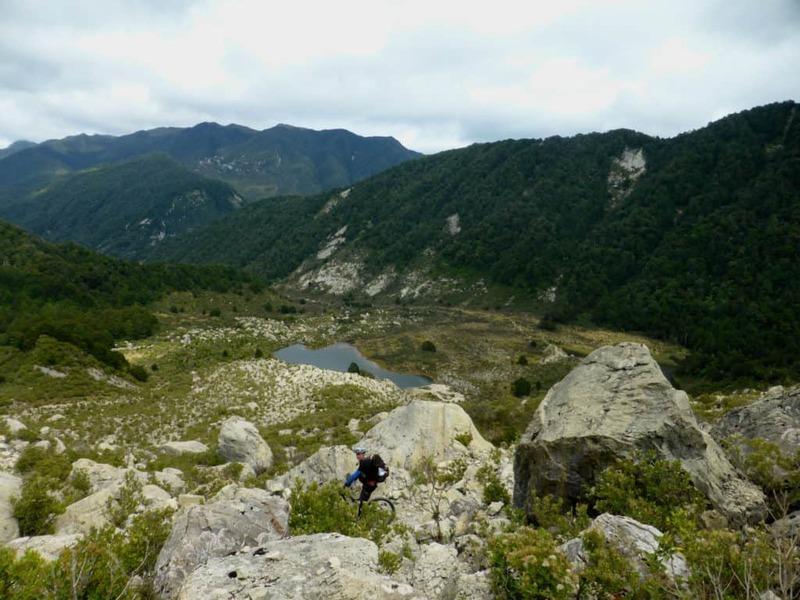 Of the 10Km to Ghost Lake Hut, actually only ~6Km of it is a climb. However there is no denying it, it’s tough and seemingly never ending. Although when it eventually it does, every single drop of sweat is worth it for the incredibly rewarding views along ridge-line. 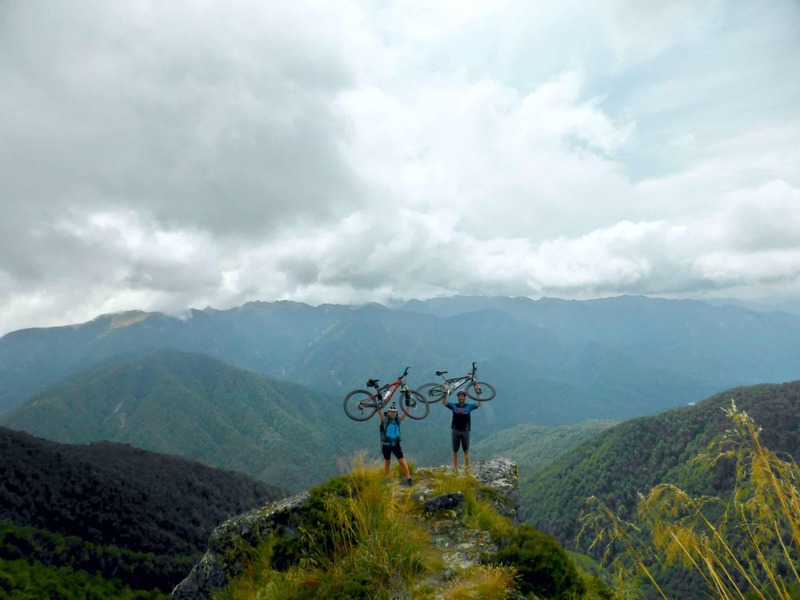 With both views to the West and East, it really feels like you’re on top of a mountain with your bike! Our average speed dropped significantly along the ridge. This was for two reasons, firstly in places it’s pretty technical, narrow and has steep drops each side and secondly it’s such damn impressive views! 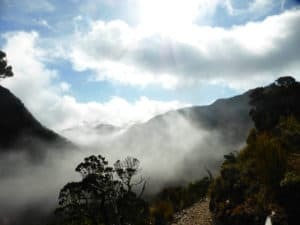 At the top, the track stretches out in front of you for the next few Km’s, carved into the side of the ridge by some hardy volunteers, it winds its way along with steep drops offs to the right then steep drop offs to the left. Concentration levels are high along here, one wrong move and you wouldn’t be coming back up for another go! The track surface is loose, big rocks and loose rocks complicating the path ahead. Negotiating these was a great challenge. 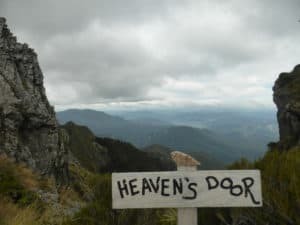 The views continue, The Kahurangi National Park and views of Nelson Lakes National Park roll out all around you, mountains and bush for miles. After numerous photo stops (we stopped about 20 times in 5 Km!! 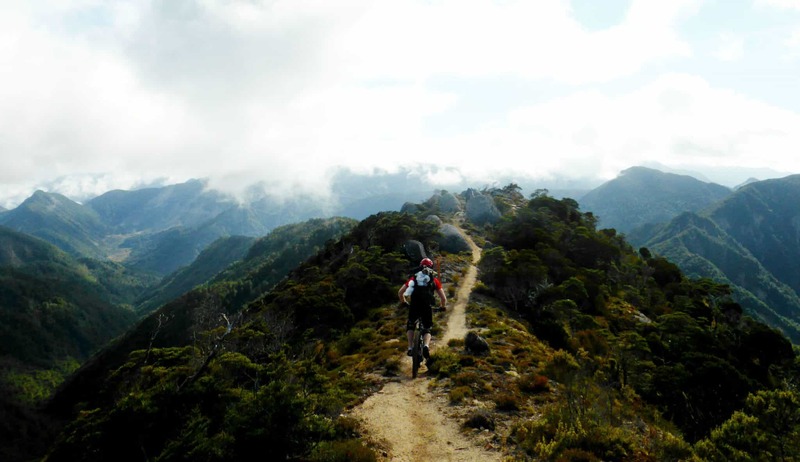 ), some bike walking and some exciting riding, the track started to head downhill. It’s the first downhill of the day, taking us to the Old Ghost Road hut, where we arrived super excited and seriously stoked! The hut is literally perched on the ridge with extensive views out into the National park, and you can clearly see tomorrows phenomenal ride!! In the cosy, well equipped hut, we eagerly scoffed down our afternoon snack. We were stoked that we had toughed it out and carried the cheese, crackers, olives in the backpacks! On a high we spent the rest of the arvo swapping riding tales with fellow bikers in the sunshine out on the decking. We were so excited to get started on the track!! The first section of downhill is steep, exposed with some seriously tight switchbacks to tackle. That is if you’re not looking at the stunning views of the valley in front of you!! Before long though, we hit a grueling uphill for a few Km’s to the top of the next ridge. But don’t worry, again it was worth every inch of hard work!! We thought yesterday’s ridge-line views couldn’t be beaten…. we were wrong! The Skyline Ridge is just awesome!! From here there is some bike carrying down steps, but it’s no big deal. And it’s very much compensated by the next epically long, fast, flowing downhill that follows, through the bush down to the next valley bottom. Here the track flattens out and we negotiate the first of a few swing bridges. We took the opportunity to regroup and ride together to Stern Valley Hut, then onto our planned lunch stop was the Goat Creek Hut. Goat Creek Hut is a few mins off the track, but is well worth a visit. It’s a classic old kiwi back country hut. Have to say, we were thankful for the hut as the number of Sandflies on standby ready to attack us when we got there was immense!! 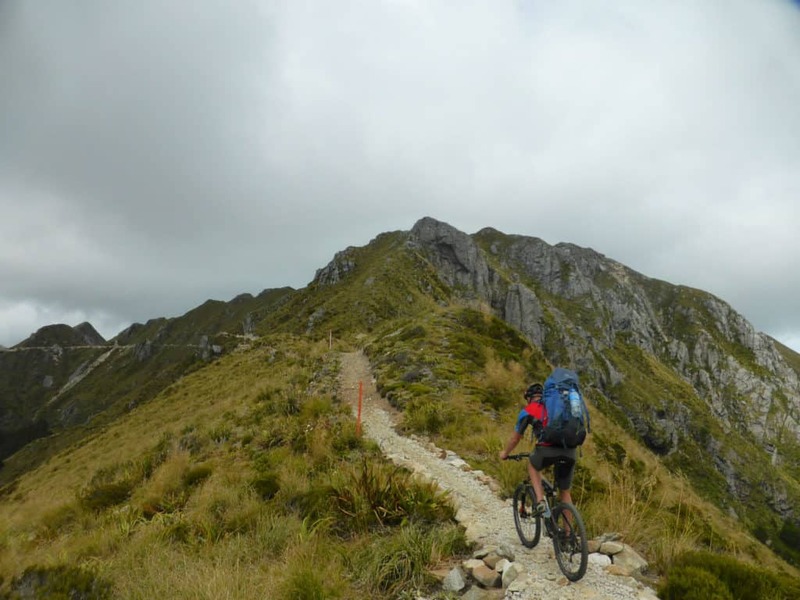 From here the track winds its way through goat creek valley to one of our favourite tough bits of the ride! The Boneyard!! When we got to this bare and stony climb it was sunny and extremely hot. The ride up the track though the rocks and boulders is honest. However, it was one of those climbs where you get a buzz from putting in the hard work!! And whoa on the other side of the saddle, is another superb long, flowing downhill. One of the best. Back wheels were sliding round switchbacks and the pace was fast and exhilarating for a good long time!! The next section of track through the bush is easy riding and we got the pace on. Nailing it through the beautiful native bush and counting the km’s flying by. 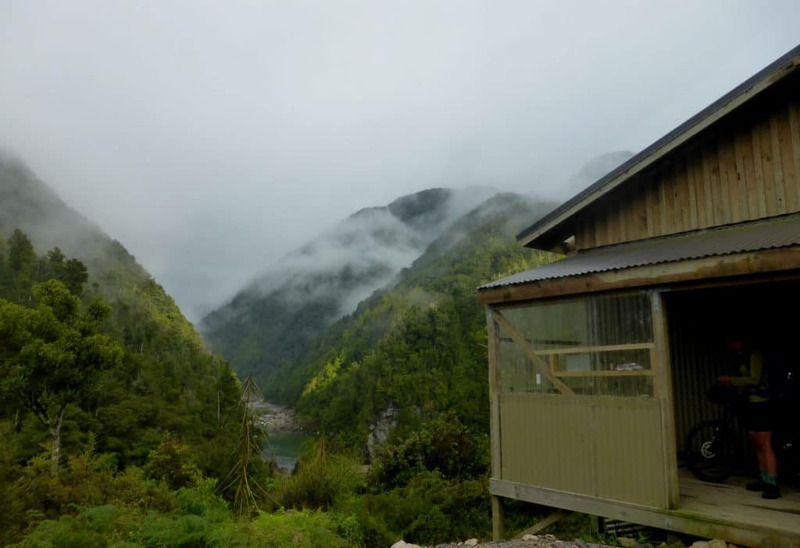 You get peeks of the river next to the track and maybe even getting wet, crossing side streams before you get to Mokihinui Forks Hut. 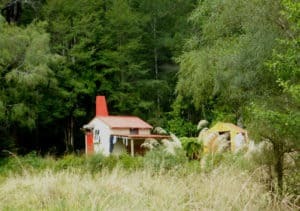 From here it was an easy few km’s to our hut for the night at Specimen Point. Points to note about Specimen Point hut are: Sandflies, Sandflies and more Sandflies!! It was like World War Z with them gathering outside!! The view is great but we advise you only look at it from inside the hut!! Although just a km or so down the track there is a swimming hole if you’re feeling brave… we weren’t!! For our 3rd and last day, the weather deteriorated slightly but it was still incredibly beautiful riding. 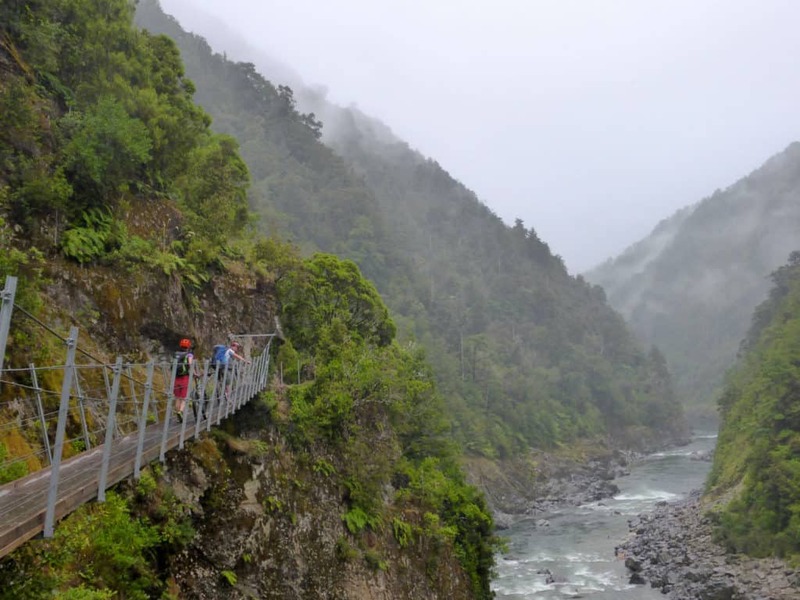 The 17km mostly running parallel to the Mokihinui river. (note for paddlers a great grade 3 run with the right levels!). The riding is quite technical along this section, in order to not end up in the river! 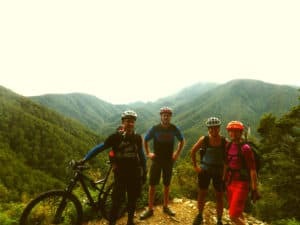 It is impressive due to the sporadic glimpses up and down the valley and the gorgeous ever changing bush vegetation as you ride.